Concrete staining adds color and nice appearance to a dull surface and takes 2 days to finish completely. Concrete staining is a difficult process but affordable for everyone. As it lends a good appearance, you should definitely go for it. Before staining, the concrete must be cured that takes 21 to 28 days. For concrete staining, here are few steps to follow no matter if you are doing it yourself or a professional is doing it. The type of stain and color are essential to decide as there are two types of stains available. First is the acid stain which creates rich earth tones whereas the water based stains provide more color options. Water based stain is safe and user friendly. Also, these stains require additional preparation of the surface to open the concrete. Whereas the acid based stain takes more time to react with the concrete. Now it’s the time to prepare the surface no matter if you are staining the old or new concrete. Complete preparation is essential for good results. You can use acid stains for that purpose as they are translucent unlike paints and coatings. With the help of acid stain, the concrete surface will easily make residue visible to you. Either you can go for mechanical grinding or a specially formulated cleaner for surface preparation. Once you are done with the cleaning or preparation of the surface, you need to apply the actual stain. For that purpose, what you have to do is mask off the area in order to protect the walls, windows and door frames. Dilute the stain in water according to the desired ratio mentioned in the manufacturer’s recommendation. When the mixture is ready, brush it or spray the first coat. If you do not have any spray bottle, buy one from the market as spraying is better to get good results. Airless sprayers, pump sprayers, production guns and HVLP sprayers etc. work great. In cases when you want accurate control over the application, brush or sponge works wonders. As you are done with the application, wait for it to dry properly. The temperature, air flow and humidity of the surroundings decide the drying time of the stain. In normal weather conditions, 15 to 20 minutes are enough to dry to the touch but the total time to cure is around 24 hours. Check the color intensity the next day and if desired, repeat the process again until you get the required color. It is suggested to wait for few hours before you apply the next coat in order to make sure there are no patches or discoloration on the surface. Using clean water, rinse the concrete properly until the water becomes clear. Take some baking soda or ammonia and neutralize the stain. Neutralization is required if you have used acid stain because water based stains do not require this. Before you do the final rinsing, extract out the stubborn residue with the help of a broom or soft bristled brush. Now is the time to apply a sealer. Once you are done with staining, let the concrete dry overnight and then go ahead with sealer. To get optimum durability out of the sealer, it is recommended to apply two coats. Also, because the type of sealer you choose depends on the indoor or outdoor concrete. Other than that, the level of gloss is also to be taken in consideration while choosing the type of sealer. Next, wax or floor finish can also be applied to lend extra protection against scratches and scuffs. You need to be careful while staining concrete. Make sure to prepare the surface properly in order to remove dirt, dust, contaminants and defects that can ruin the staining at later stages. To get beautiful staining, surface preparation must be done carefully. As acid stains can be tough, they are also hard to remove if things go wrong. Mask off the surrounding areas to avoid unintentional staining. Before applying the stain, you need to test it first so as to know whether or not the stain is right for your concrete surface. Because it can affect the final color of the concrete, testing will give you the right preview of how the finished surface will look. Follow the manufacturer’s directions when you apply the stain. Since the manufacturer knows the best application tools, it is suggested to do what is recommended. Acrylic stains have different requirements as compared to acid based chemical stains so surface preparation, cleanup and application for both stains is different. Add water to dilute the stain by either wetting the concrete or by spritzing the concrete. This is to be done after applying the stain. Various concentrations of color are produced by mixing water with stain. If the concrete surface is not stained properly, you can apply a tint or concrete dye. Remove the surface residue before using an acid based stain. It is important so that the sealer bond properly. For that, mix water with detergent, a tablespoon of baking soda per gallon of water. It will neutralize any remaining acid, use a buffing machine with a scrub and using a wet vacuum to pick up the residue. Once done, rinse until the water runs clear. Use a sealer to protect the newly stained surface. The concrete floor must be maintained to make it in good condition. For easy cleaning and maintenance, a good sealer helps because it works as a defender. A quality sealer not only adds protection, but it also puts shine and removes dirt, debris and stains. 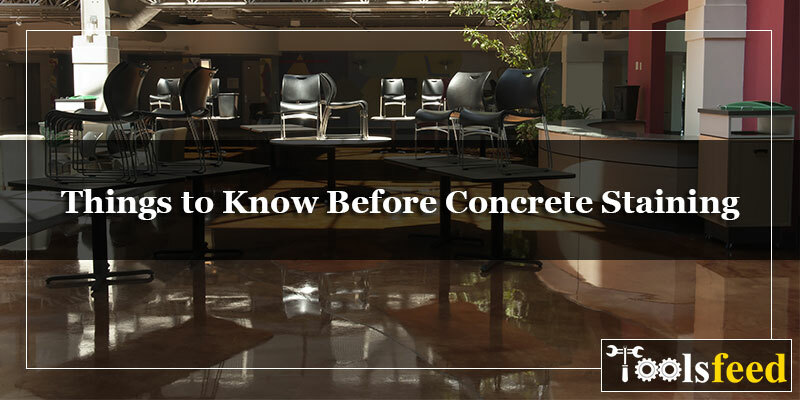 It is a little tough to keep dirt, dust and debris off the stained concrete surface. Special care is needed to keep the surface in good condition. For that, a mild cleanser will wash off the build up or spills or any floor wax. A properly stained and sealed concrete floor is easiest to maintain and clean as compared to other flooring types. When it comes to spilling and dirt, carpet is absorbent and some people go for hardwood flooring to avoid the hassle of cleaning the carpets. Hardwood flooring is water resistant but concrete is waterproof. So concrete flooring is popular these days given the ease of cleaning and maintenance. Concrete looks good and clean and it is not vulnerable to damages like moisture, pests, mold, and humidity unlike other flooring materials. Concrete floor is not prone to rotting, termites or water damage. The longevity of concrete flooring depends on the amount of maintenance and care you do to keep the surface in good condition. The Ultimate Guide on How to Use Metal Glue?